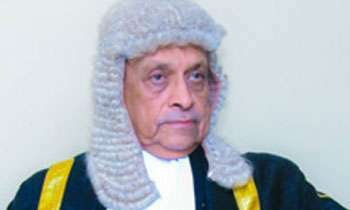 Former Speaker Karu Jayasuriya today said the Executive Branch has seized the rights and usurped the powers of Members of Parliament who were elected to represent the people. In a statement, he said the willful disregard demonstrated by the executive towards Parliament, the engine of Sri Lanka’s sovereignty, leaves the rights and freedoms of ordinary citizens at grave risk of similar abuse. “Under these dire circumstances, I urge all public servants who have sworn an oath to defend the Constitution to revisit that oath. Ask why we are required to pledge fealty to this document and not to any one person or a single position of power. Our foremost duty is to the Constitution. I ask all public servants across the country to remember their obligations to this supreme law of our motherland, and to safeguard the independence of the public service, police and the judiciary. I call upon all public servants to refuse to execute any illegal orders they may receive, no matter from whom,” he said. He said every citizen who is entrusted with responsibilities under the Constitution should think first of the country and not of party politics or personal affiliations. “The leaders of several political parties represented in Parliament have informed me that they will be challenging the purported dissolution of Parliament in the Supreme Court. Since the President has prevented Parliament from ruling on the legitimacy of the President’s actions, it will be up to the Supreme Court to determine the legality of these actions. As the custodian of Parliament, I have watched over the last two weeks as the executive Branch has seized the rights and usurped the powers of Members of Parliament who were elected to represent the people. The willful disregard demonstrated by the executive towards Parliament, the engine of Sri Lanka’s sovereignty, leaves the rights and freedoms of ordinary citizens at grave risk of similar abuse. Under these dire circumstances, I urge all public servants who have sworn an oath to defend the Constitution to revisit that oath. Ask why we are required to pledge fealty to this document and not to any one person or a single position of power. Our foremost duty is to the Constitution. I ask all public servants across the country to remember their obligations to this supreme law of our motherland, and to safeguard the independence of the public service, police and the judiciary. I call upon all public servants to refuse to execute any illegal orders they may receive, no matter from whom. Every citizen who is entrusted with responsibilities under the Constitution should think first of the country and not of party politics or personal affiliations. We must all act with patriotism and independence to safeguard the future of democracy in our country. I lament that the purported Foreign Minister, a highly regarded politician, has falsely alleged that I intended to prevent the President from delivering the Statement of Government Policy when Parliament was set to reconvene on 14th November. It is on this imaginary premise that the Minister suggests that Parliament had to be dissolved. I wish that the purported minister had proposed a more honest and plausible excuse for the actions of his colleagues, that would have drawn less ridicule to our country on the world stage. Based on this fiction, several of his cohorts have openly threatened to send me to jail. A floor vote on the legitimacy of the government was requested by 124 Members of Parliament. 116 Members met me in person. Another eight thereafter contacted me and expressed their support of this motion. Just as Speakers of Parliaments have done for centuries before us, I ruled in favour of the rights of the majority of Members and political parties represented in Parliament and declared that I would allow a floor vote. No member made request that the Statement of Government Policy be prevented nor would I have entertained such a request. As a former military officer, I have always been prepared to make whatever sacrifice that my country may require of me. It has been my privilege to stand up to the executive and defend the rights of Parliament, the supremacy of our Constitution and the sovereignty of the people. HATS OFF TO THE SPEAKER FOR HIS LAUDABLE PRINCIPLED STAND! I hope his "steel mind and iron body" will defend his principles at all times!! Politician with ethics. A rare combination. Aiyo Siri, now its your turn to say something. Great! Please uphold peoples' mandate and the constitution. We don't want SL to become a Banana republic! Well said Sir! I just hope and pray that the citizens of our country will act wisely and not resort to violence in this troubling period. Thanks for your comment .A soldier and a gentleman . Not like b/s mara and sira. Grate. Our salute to you Sir. Sirisena has become a tin-pot dictator. Well said. Not every person can handle the pressure of executive presidency. It it clearly shown by current head of state. Hope supreme court stops parliament election for the time being and go for the presidential election. I think its time to make all our mind to say that current president needs a rest. What a comical statement! You should set an example to public servants by defying the presdential decree and calling the parliament first. We'jj follow. Another mara slave. Stupid aholes . Doesn’t know anything about the constitution.
" I ruled in favour of the rights of the majority of Members"Really Mr. Speaker? Where was this "ruling in favour of the majority" when you gave the Opposition Leadership to a member from the minority in the opposition? The UNP-biased majority who are reading this might hail you as courageous and honest. But, for a majority of the country, you desecrated the dignity of the Speaker post. All the joint opposition members competed the election under UPFA and the same party formed national government with UNP. Without the application from the party secretary of UPFA how the speaker could appoint a party which is taking part in forming the government. Before charging people we should known the fact. Well said Sir. Thats a mouth full.I hope the President of the country reads this statement. I hope the HE gets a sinhala translation of this!! You will go down in history as the only Speaker who had the guts to challenge the Executive. Hats off Sir. Mahinda will look after Srisena. we have to build the democracy. stupid people you do not have any intelligence. Period. An excellent statement a little too late.Where were you during that broad daylight Bond scam?On another Planet? Political opportunists salute and sing his praise. What has the bond scam to do with democracy and the constitution? Who is responsible for this state of affairs. Non other than Ranil. He did not allow this gentlymen, Karu Jayasuriya to contest at that election. He brought Sirisen thinking that he can manipulate Sirisena like people for ever as he wants. you are another slave of mara. it was not ranil alone . KARU - Thanks for being FIRM and STRAIGHT . Great decision for respecting the democracy and the ordinary man. The person who brought a number of thieves or rejected characters by the people @ last parliamentary election into the good governance should undertake the responsibility for this crisis and he was the one who pooed on democracy.The one who likes to take up the hat can put on the head!!!Hon. Speaker Karu!! Somehow in the future I'm 100% sure that you will definitely be known as the Bravest Speaker of the entire history.Extremely pleased to see a character like you and as a Sri Lankan I'm proud of you.